Hanza Nukui is introduced during The Captain Amagai arc as the leader of the assassination squad under Gyokaku Kumoi, Ichigo's first Kasumioji rival, and was the main antagonist during the first half of the Captain Amagai arc. He was formerly part of a clan that served the Kasumioji clan, but agreed to assassinate Princess Rurichiyo Kasumioji because he believes that she is not strong enough to lead the clan. He does not seem to possess a Zanpakuto; he and his assassins instead wield interchangeable organic weapons that bond to their arms, known as Bakkoto, developed by the Kasumioji clan for his and his fellow assassins' use. After seeing Ichigo successfully defeat his assassins several times, he becomes impressed with his strength, and decides to fight him himself. 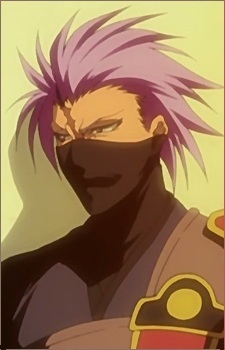 He is forced to withdraw due to Yoruichi's intervention the first time, and later tries again with his subordinates. Despite using his Bakkoto to imprison Ichigo within an illusion, Ichigo breaks free, and Hanza's Bakkoto subsequently devoured him. Hanza primarily wields the Bakkoto Saiga, which evolves by devouring the spiritual power of its user. It has the ability to momentarily paralyze opponents by reflecting moonlight into their eyes and can create an alternate dimension in which the opponent is left conscious but unable to move. If he channels more reiatsu into the weapon, he can create illusions based on the targets' memories, trapping them until their souls are crushed. At full power, it is able to shoot energy bolts similar to getsuga tensho blasts.